With many people looking for ways to save money, another option is to consider turning your valuables into cash. How though do you turn your jewellery into cash for example? We take a look. Pawnbrokers have been around for a long time, with many flourishing as people turn to them for short term loans to cover expenses. Online pawnbrokers, as well as those in the high street, are seeing more people turn to them to free up cash from their assets. With gold prices continuing to escalate many are also looking to see how they can cash my gold. High gold prices mean it is an attractive time to sell and equally there are more and more online companies looking to buy your gold. 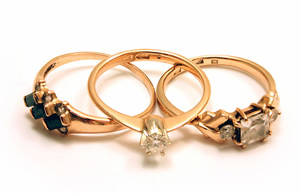 Even a small amount of gold in a ring or necklace can be very valuable to secure some cash. Whilst online companies make it sound very easy to cash my gold, if you do decide to do so you want to make sure you get the best price possible. There have been some horror stories of companies offering very low values. Of course reputable companies will offer you a fair price but one way of making sure you are not being ripped off is to find out beforehand what your gold is worth. One option is to ask an independent jewellers nearby for a valuation. You could also weigh your gold, in grammes, and then using the current price of gold, which you can find on websites, you can roughly calculate the value of your gold. Remember the price you get from an online buyer will be less than then you might think, perhaps by 10-20%, to accommodate the buyers profit margin. Some sites will show the prices they are offering to buy gold at and you can clearly compare what you believe the value is to what is being offered and determine whether you are happy or not. Those that don’t show their prices expect you to send your gold to them, they will assess it and then offer you a value. They anticipate most people will accept their offer, even if low, as you have already gone to the trouble of sending your gold to them. If you know the value though you may haggle on the price – they may well up their offer on the basis it’s easier for them to do so than have to send your items back to you. Importantly, whilst you can get some good cash for your gold at the moment, you do need to do make sure you enter the transaction with your eyes open to get the best possible deal.